Take me out to the ballgame? Yes, please! Preferably in the Steel City to watch the Pittsburgh Pirates — with my family by my side. This Major League Baseball Personalized Family Cheer wall art piece will show how much you cherish both your family and the Pittsburgh Pirates. This sports decor comes ready to hang with a high-quality, custom print behind glass. 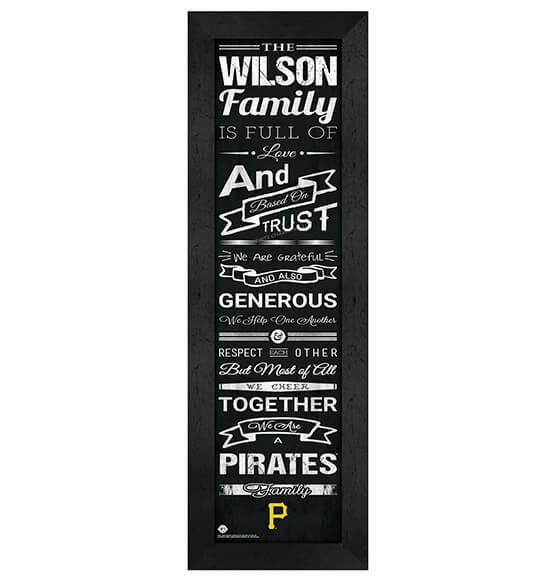 Sweetly touching family sayings in team colors above the Pirates' logo give a spirited, heartfelt touch. Whether this personalized Buccos wall art is for yourself or a gift for a friend or family member, it's guaranteed to bring joy. Great for family rooms, great rooms, offices — even bedrooms!